Previously thought to be extinct, the Critically Endangered Madagascar Pochard (Aythya innotata) was rediscovered in 2006 when a small population was found at a remote site in the far north of Madagascar. An emergency expedition was sent to the site in 2009 to collect eggs, which were successfully reared in captivity and, since then, the considerable effort that has gone in to saving this species from extinction now gives it a glimmer of hope. The captive population of Madagascar Pochard now stands at 74 individuals (in July 2016). 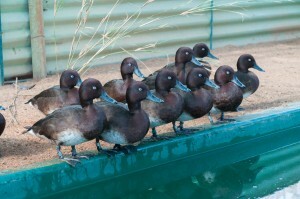 The pochards are kept in a specially built facility in the town of Antsohihy in northern Madagascar. Chicks reared in 2015 were the first chicks to be reared entirely by Malagasy aviculturists without supervision from expatriate specialists, making the long-term future of this population look far more secure. The wild population remains stable at approximately 25 birds. Fledging success, estimated as just 3% in previous years, continues to be extremely low. The cause of this high duckling mortality is thought to be unsuitability of the habitat, as the lake on which the pochards bred is steep sided and contains no shallow areas, which makes it difficult for diving ducklings to reach food. The Bemanevika National Protected Area, which encompasses the lakes on which the wild population lives along with the surrounding forests, was officially declared in 2015, a huge step towards conserving this important landscape. A survey of wetland sites in Madagascar carried out in 2012 and 2013 failed to identify any sites suitable for releasing captive bred pochards; a sad reflection of the state of Madagascar’s freshwater wetlands. Using funding from the UK Government’s Darwin Initiative, work has started towards restoring a site. The project aims to empower communities to benefit from natural resources at the lake while also improving conditions for biodiversity. Initial activities are focused on developing the local management structures through which habitat management and restoration can occur. Biodiversity-friendly farming practices are also being promoted among local villagers, as a first step towards management of the watershed. Further information on Madagascar Pochard conservation can be found here and here. Thanks to Andy Bamford (WWT) for this news update.